Exhilarating ninja action. Assuming the role of a ninja warrior, players will experience an all-new combat system that requires skill and mastery of their full arsenal of weapons, including Obliteration Techniques that allow players to quickly and stylishly finish off an opponent. In addition to the variety of brutal new primary weapons and enhanced versions of previous favorites, Ninja Gaiden 2 will feature unique acrobatic combat and attacks used not only by Ryu Hayabusa but also by his formidable enemies. Easy to play but hard to master. The new auto-healing system in Ninja Gaiden 2, featuring semi-permanent damage restored at save points, is the natural evolution of the franchise's distinctive gameplay and introduces a new twist to managing health. 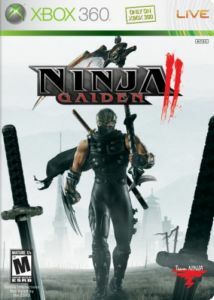 With a newly implemented auto-healing functionality and save-point system, as well as an extensive story mode and multiple difficulty levels available from the start of the game, the gameplay of Ninja Gaiden 2 will be both accessible to more casual players and challenging to even the most demanding gamers. Massive content and engrossing story. The themes of revenge and friendship in Ninja Gaiden 2 give rise to a series of dramatic events to create a truly compelling story. From Tokyo to New York and to the netherworld, the story will lead players through a lengthy, action-packed story mode as they skillfully maneuver Ryu Hayabusa through a demonized world fraught with peril and danger. In addition to the single-player campaign, players can upload Karma scores to Xbox LIVE leaderboards and participate in an all-new Master Ninja Tournament. Realistic graphics in next-generation gaming. Built from the ground up from Team Ninja's in-house gaming engine for the next-generation Xbox 360 platform, Ninja Gaiden 2 represents the best in amazing visuals, responsive control and thrilling combat with an extensive assortment of ninja weaponry.